Twenty years without the need to fill out a job application and submit resumes had its perks. The downside is that I am in unchartered territory in going through a normal hiring process. It is challenging, exciting, and a bit frightening at the same time. Self-reporting strengths to list on a resume is actually pretty difficult. I was not good at writing drafts for my annual evaluations in the Navy because I suffered from self-criticalness. People could point out positive traits and characteristics to me but my tendency was to focus on the negative. One small negative became all encompassing as the positives faded into the background. It is much easier to find good in others than to look inside and find it in yourself. I do enjoy pointing out positives in other people and emphasize progress even when forward momentum comes in seemingly insignificant steps. I have found there is both an art and a science to having a positive approach. The science part is easy: spot a positive action or statement and emphasize it. There are numerous empirical studies on the effect of positive statements. The same can be said for the effect of negative statements. Have you ever felt fine but be told you look ill? After a few similar statements you begin to physically feel ill. Now imagine the process in reverse. Ever felt particularly horrible and then have someone tell you how good you look? Doesn’t seem to work as easy in reverse. The art of being positive comes in knowing when to use positivity, how often, and with whom pointing out positives would be most effective. There is also art in knowing when being positive turns into being annoying. Having an optimistic approach is more than simply being upbeat. It involves finding the positives in others and sometimes you really have to look hard to find something to encourage. However, there is always something positive to find. Sometimes people get so down they are simply unable to spot positive things happening in their life. I have found that most people who struggle to find something…anything…good going on in their lives didn’t become that way overnight. It took a while to develop this type of tunnel vision. Changing an outlook takes time regardless of making the change from positive to negative or negative to positive. The funny thing is that when I point out the positives in others, often they don’t realize what they have accomplished until hearing it. When I turn my “strength” of finding positives in others toward myself, I notice my self-criticalness lose some of its sting. I can own my mistakes because I know they are a part of me. My mistakes, along with my accomplishments have made me who I am today. Looking within and finding my own positives initially seemed selfish but I realized it was not self-absorption but rather part of a self-care regimen. Creating mandalas is one method I use to “look inside.” After completion I like to view my creation to see what speaks to me, or rather, what my unconscious is trying to tell me through the drawing. 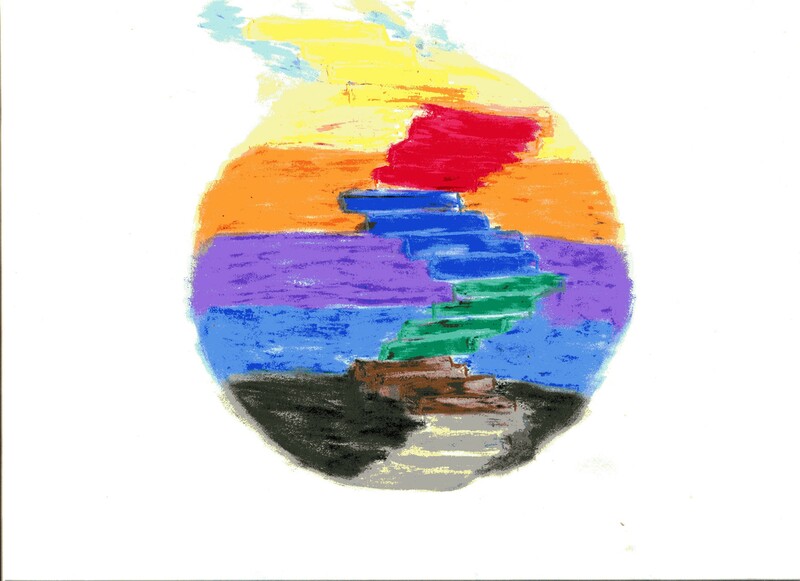 The mandala above reminded me of steps leading toward gradual change. Steps can go up into boundless opportunity and steps can go downward into murky territory. Both paths are open and it is up to the one making the journey on which direction to take.